I was fortunate to take in a last minute trip to New York this month. As a first-timer to the Big Apple I had a list of things I wanted to see and do. Like many women, I craved the shopping. The brands, the designers, the looks you just can’t get in little old Saskatoon. I wanted to invest in some items for work attire. As a gal considered to be the small end of the plus line, this often means my options are limited. But my goodness, I thought, this is New York! Alas, it was not meant to be. The only comprehensive google list of plus shops I could find was several years old and half the stores had closed. The reality of my shopping excitement soon deflated when I realized that retailers in Manhattan aren’t much different than their Canadian counterparts. Manhattan is really only fashionable to certain sizes. Not to be discouraged, however, I made steadfast to the big departments stores. They always have a section with women like myself in mind. Surely they would not disappoint! The Bloomingdales and Macy’s of the world serve all shapes and sizes. But the merchandising in these stores shows is a telling story of where the bulk of their money is made. Macy’s Herald Square is the flagship of the Macy’s department stores. Its 2.2 million square feet has made it the world’s largest department store since 1924. The store has multiple floors and directional maps to tell you where to find departments. The bright, shiny and inviting first floor got me excited to explore. Signage indicated that the first three floors were ladies wear, followed by two floors of men’s and then children. The plus section was a trek, they weren’t going to make it easy on me. I was going to have to find the 7th floor. The modern front escalators only take you up the first three or four floors. After that you have to move through the labyrinth of clothes racks to nearer the back of the store to access the original escalators (see photo). 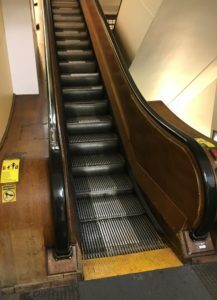 As I moved up floors on the rickety though kind of cool escalator, things got a little less shiny and a little more dog eared. The shame of plus shopping I was so familiar with was setting in. Upon arriving at the 7th floor I discovered someone with a particularly twisted sense of humour had placed the plus section on the same level as the food court. Grab a Big Mac and the size 20 pants are this way! I won’t slag the selection. Macy’s did deliver in this regard. Even if the dressing rooms were filthier than an Old Navy back to school sale. I was tired and dejected so I only grabbed a few items to try on. A quick calculation of the dollar exchange and I determined I could buy the same Ralph Lauren pants cheaper online from the Bay when I got home. I left empty handed without one of the trademark red shopping bags. The reality is that plus size sales likely don’t make up a large portion of Macy’s or many other big retailers’ bottom lines. That’s why the product isn’t always right up front or given much consideration. Which is weird because I saw many women walking in Manhattan that were my size and bigger. So are the big retailers missing out on this untapped market? Probably not. In my experience, it seems like plus size women have programmed themselves not to invest in wardrobe. Be it the thought that they may lose the weight burdening them or that they just aren’t worth it, I can’t say for certain. For myself, I’m okay at my size. Sure I’d like to be thinner but I can’t wake up every morning dreading getting dressed. In my field there is a level of professional dress I’m expected to adhere to. The frustration of finding quality work wear is the bane of my existence. Even Macy’s couldn’t make it easier.